Euro zone periphery bulls should be eyeing up Banco Espirito Santo. The troubled Portuguese bank’s shares were at one point down 20 percent on July 15, and it needs capital to stabilise itself. For hedge funds looking to profit from Europe’s banking recapitalisation, or an acquisitive bank, this is the moment to pounce. BES is cheap. An 11 percent fall in BES stock means its 2.2 billion euro market capitalisation is trading at only a third of tangible book value. Obviously there is a reason: BES’s exposure to the Espirito Santo group (ESG) chain of companies, which previously controlled the bank and now face a painful debt restructuring. One of those companies is selling its BES shares to avoid default. How bad could it get? BES has lent 1.2 billion euros to ESG, and may have to repay retail investors who hold 850 million euros of ESG debt it sold them. The bank also has a 2 billion euro loan to its Angolan subsidiary, and equity in that unit of 663 million euros. Assume 100 percent losses on BES exposure to ESG and the retail debt. Assume also a total writedown of equity in Angola, and 50 percent losses on its Angolan loan. In such a scenario, BES would need 1.5 billion euros of capital to restore its common equity Tier 1 ratio to an acceptable 10 percent, according to Breakingviews analysis. An investor who bought at today’s 0.3 times book value, and plugged in the new equity, would still own a stable bank at a price-to-book of 0.7 times – a 30 percent discount to peers. If it was as simple as that, private investors would be beating a path to BES’s door. The snag is concern that the bank may have even more exposure to the Espirito Santo family, not just its companies. A chaotic restructuring could lead to more forced sales of BES equity, or delay a recapitalisation. And the Angolan business is a black box. Those uncertainties make BES a punt – but also a test of how far periphery bulls are prepared to go. 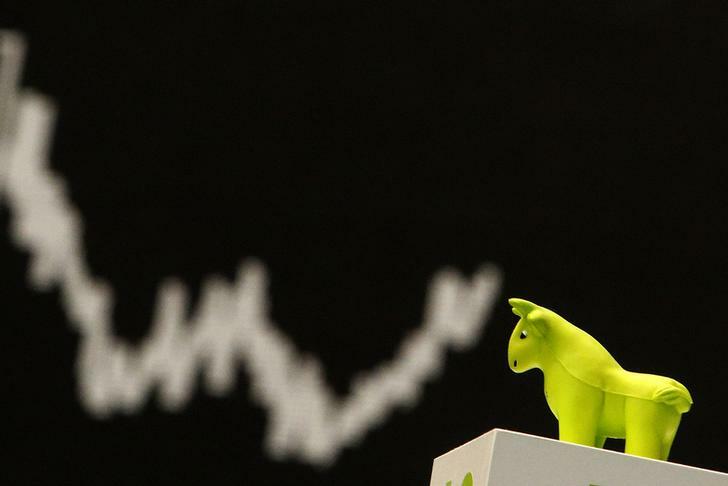 A bull figure is pictured in front of the German share price index DAX board at the German stock exchange in Frankfurt November 7, 2012. Banco Espirito Santo shares fell as much as 20 percent on July 15, after Espirito Santo Financial Group sold a 5 percent stake in the bank to meet a margin call, and ahead of a deadline for Rioforte, which owns ESFG, to repay 847 million euros of maturing debt. BES stock was down 7 percent at 0.41 euros per share at 1255 BST.